Cambridge, UK 29th November Opus Materials Technologies Ltd, industrial coating specialists, has secured close to £1million in funding from Innovate UK (under the Energy Catalyst 4 competition project) to validate & test the industrial rollout of a durable, self-clean coating, developed to optimise energy production of solar PV panels. Opus, together with consortium partner Above Surveying Ltd, experts in aerial surveying using thermographic cameras and flight data logging equipment, are measuring and monitoring the impact extreme weather conditions have on the performance of this novel new coating, by conducting rigorous field trials in adverse geographical locations. Other members of the industrial consortium partners include TWI Ltd, Loughborough University and Cornelius Specialities Ltd. Above Surveying are developing an automated soiling assessment methodology using a UAV, optical sensors and image data analytics to streamline data analysis processes. 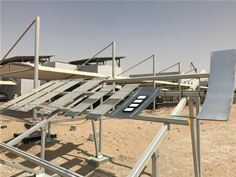 Industry research has already proven that the accumulation of dirt and soiling on solar modules deployed in solar farms can reduce their power output by up to 50% per month. Not only are such large energy losses having a direct impact on O&M costs, they are reducing the perceived benefits of investing in solar energy in the developing world. The new coating technology, branded as Solar Sharc®, eliminates surface contamination problems caused by salt, dirt, dust or ash because it removes the need for manual cleaning. Furthermore, its unique chemical composition, which produces a lotus leaf effect, dynamically repels external pollutants, making it mechanically resilient to environmental ageing. "We are really excited to be taking a leading role in this research project,” comments Will Hitchcock, Managing Director of Above Surveying Ltd. “Through our aerial thermographic inspection services, we have already proved the value of the UAV in the solar industry. This Innovate UK funded project enables us to be involved in the development of a potentially ground-breaking product for solar energy as well as pushing the boundaries for the use of UAVs in this growing sector." Apart from offering significant operational and maintenance benefits, Solar Sharc®’s self-cleaning capabilities reduces water wastage, a valuable resource in arid & developing countries. Furthermore, this novel new coating has the potential to contribute in part to addressing the world energy trilemma (energy security, equity and environmental sustainability). The wider adoption of renewable technologies such as Solar PV can also assist global efforts to achieve carbon emission reduction targets of 2030. Extensive field trials of this innovative coating technology are already underway in Dubai and the UK, with potential field trials planned in the US, Kuwait, Chile.